Prime and stretch your own canvas without the hassle of transporting a large roll! Iron the folds before stretching or mist the canvas with warm water after you've stretched it tightly to remove any wrinkles. Choose Belgian linen or 100% cotton in a variety of widths sizes. 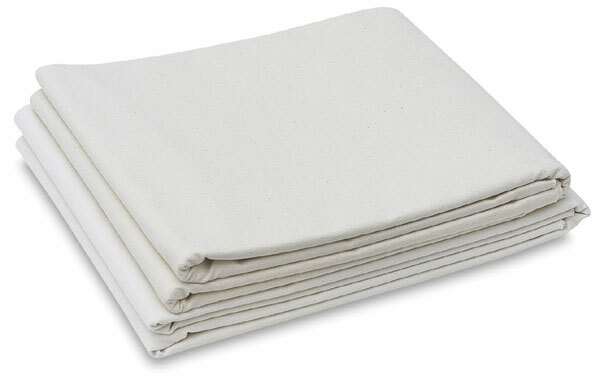 Medium Texture Raw Linen — 100% pure Belgian unprimed linen has a medium tooth and texture. 8.7 oz. Portrait Texture Raw Linen — 100% pure Belgian unprimed linen has a smooth texture for portrait painting. Available in 8.85 oz Medium or 6.5 oz Fine. Medium Texture Cotton — 100% pure unprimed cotton has a medium texture and close weave construction. 10 oz. Medium Texture #12 Cotton — 100% pure unprimed cotton has a medium texture and close weave construction. 12 oz. Medium Texture #10 Cotton — 100% pure unprimed cotton has a medium texture and close weave construction. 15 oz.